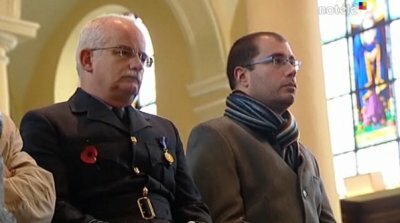 Ce Dimanche 8 novembre 2009, j'eu l'honneur de représenter la commune aux célébrations du 11 novembre à Orcq. A cette occasion, un hommage tout particulier fut rendu aux soldats britanniques en compagnie de M. Mike Firth, Wing Commander GBR AF, Executive Officer - J5 Plans & Policy Division (SHAPE). It is a great honour for me today as an alderman to represent the council authorities on this Remembrance Day. Nineteen fourteen - nineteen eighteen : Four years of unbelievable cruelty between wealthy nations using the most destructive means and crowds of fighters from diverse backgrounds to compel recognition to their own views. That is the reason why the conflict has become the First World War, although everything started in Europe, the place where the great powers were located. Commemorating November 11th is a way of paying tribute to all those people... soldiers, Resistance fighters or civil victims who lost their lives on the battle fields but also in our cities and villages. So many families have been in mourning for their beloved for such a long time! Commemorating November 11th also means that we want to pay tribute to all those people who, notwithstanding sometimes badly wounded, started believing and hoping again in a new life for themselves and for the ones they loved. However, Remembrance Day should also be a warning for young generations. Yes, we can live in peace. The Great War must remind us that we need to establish the peace process and act properly in a way that no nation would ever feel neglected and raise vengeance therefore. This is the real truth, the truth that is written in the blood of those people coming from our neighbourhood or further countries who sacrificed their lives on the battle fields and in the muddy trenches. Ladies and Gentlemen, War veterans, I would like to ask you to observe a minute of silence in memory of all those people who died for Belgium in that long awful war.